I repeat the following story with a heavy heart, because I know deep in my soul that my old buddy, Meek C. wouldn't have committed such a dastardly act. 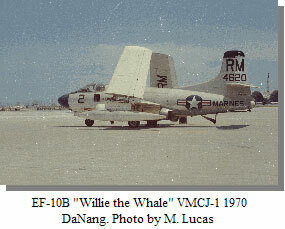 Allegedly, and that is with a very large A, there was an EF-10B deployment to NAS Floyd Bennett Field, NY in the summer of 63. A tourist note is necessary for those who don't know that Floyd Bennett was located in the heart of the metropolitan NY are. The mission was to jam a recently captured Russian Sam multi frequency radar, which was electronically scanned. An impossible task you say? Perhaps, but while insiders know that old Willie's jammers were not all that flexible or powerful, they also know that Marine ECMO's were strange and wonderful warriors. One such individual, who shall, I believe, remain nameless lest there are still any lawsuits pending, figured that jamming through a chaff cloud would cause every little chaff particle to act as a radiator and also modify the base frequency in a magical way. After attempts at jamming in the normal manner failed this brave heart called the controller and suggested a final try, which involved the dropping of chaff. Unwisely, the ground idiots approved the test without inquiring into the frequency spread of the chaff. Unfortunately, the multi-frequency chaff contained rope, which was a low freq chaff that consisted of a roll of metallically reflectant material attached to a small piece of cardboard that once deployed, acted as a parachute. This material would unroll to a length of a couple of hundred feet. To the ground goon, it would appear as if someone dropped a wall across his Radar screen. As this material settled to the ground, it would also short out any power lines that it happened to touch. Sure enough it wasn't long before people were screaming. One transmission was to the effect that the jamming had blown every tube in the system. It had also shorted out much of New York and the lights went out all over Manhattan as emergency generators came on line. Children were begat in stopped elevators and darkened offices. Women screamed in terror and evidently in pleasure and grown men laughed and cried. I would imagine that various Marine and civilian managers tip toed gingerly around for a few weeks waiting for an axe to fall as the Marines deployed back to Cherry Point. What the hell, the mission was over.